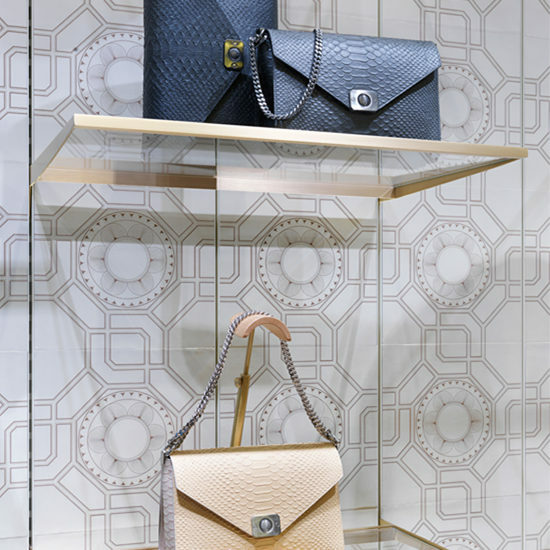 Genevieve was asked design a bespoke pattern exclusively for Mulberry for use on the luxury leather finishes for their stores globally. 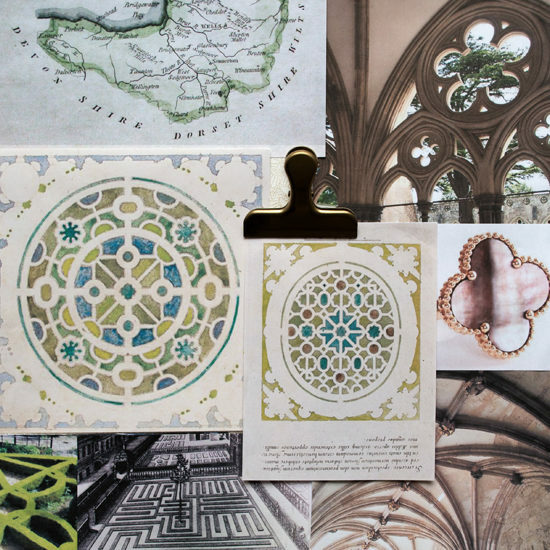 Drawing on the rich heritage of the brand and firmly rooted in English traditions, a diverse yet distinctive selection of influences converged in the research for ‘Tudor Rose’. The ornate carved Medieval stonework of Wells Cathedral in the heart of Somerset, specifically the floral motif mounted above the fluted medieval archways was an important influence. Studying sculptural form and it’s response to light and shadow has always been a key component of Genevieve’s leatherwork and provided the basis for the stylized floral motif. 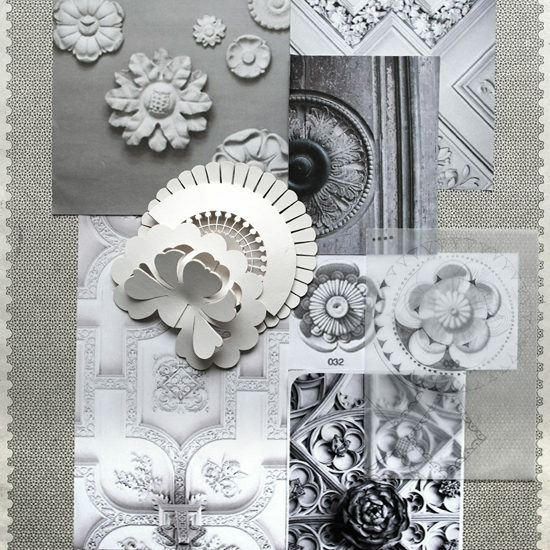 Further inspiration came from the intricacy of Tudor knot gardens, Elizabethan Mazes and Medieval English black and white timber paneling. 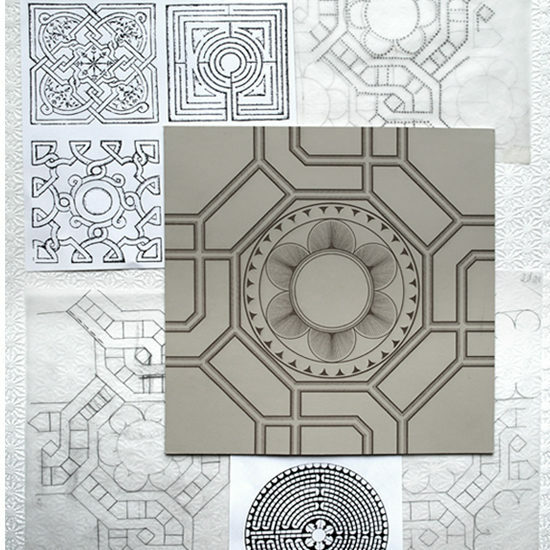 By studying the interlocking and endlessly connecting structures of Tudor mazes and knot gardens, Genevieve developed a deceptively simple repeating lattice structure, which forms the basis of the design. 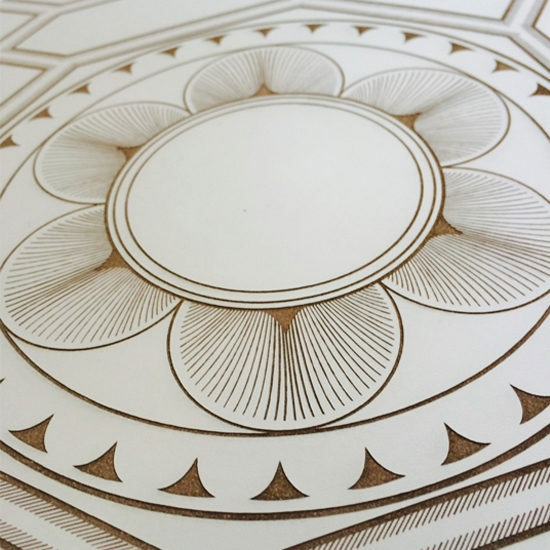 The design was then crafted, distilled and refined through repeated drawing. Additional linear shadow detailing was added to add give depth and form to the design, reminiscent of the original carved stone-work it was inspired by. ‘Tudor Rose’ was finally rendered using a detailed and precise engraving technique into premium quality cream saddle leather. Repeated in symmetrical formation, the pattern evokes the fascinating cultural origin of the piece whilst feeling unmistakably contemporary. 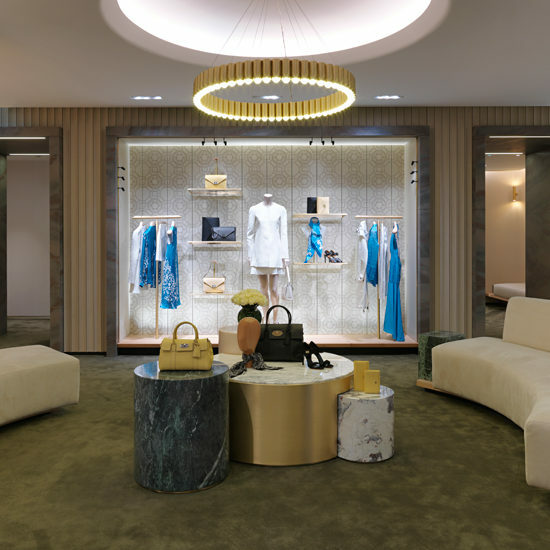 The final design was installed in the Mulberry Paris flagship store, Rue Saint Honore in April 2015.